Dr. Mark E. Richards contrasts traditional liposuction with the innovative VASER® LipoSelection® system to reveal the numerous benefits of the advanced technology. Washington, DC — The American Society of Plastic Surgeons lists liposuction as the fourth most popular cosmetic procedure in the nation. Dr. Mark E. Richards, a plastic surgeon in Washington, DC, explains that many patients who adhere to a strict diet and exercise regimen still experience dissatisfaction with their appearance due to stubborn pockets of fat that are resistant to traditional methods of elimination. As a result, he advises patients to consider an innovative technology called VASER® LipoSelection®, which typically offers greater potential for results than traditional liposuction, as well as less downtime. 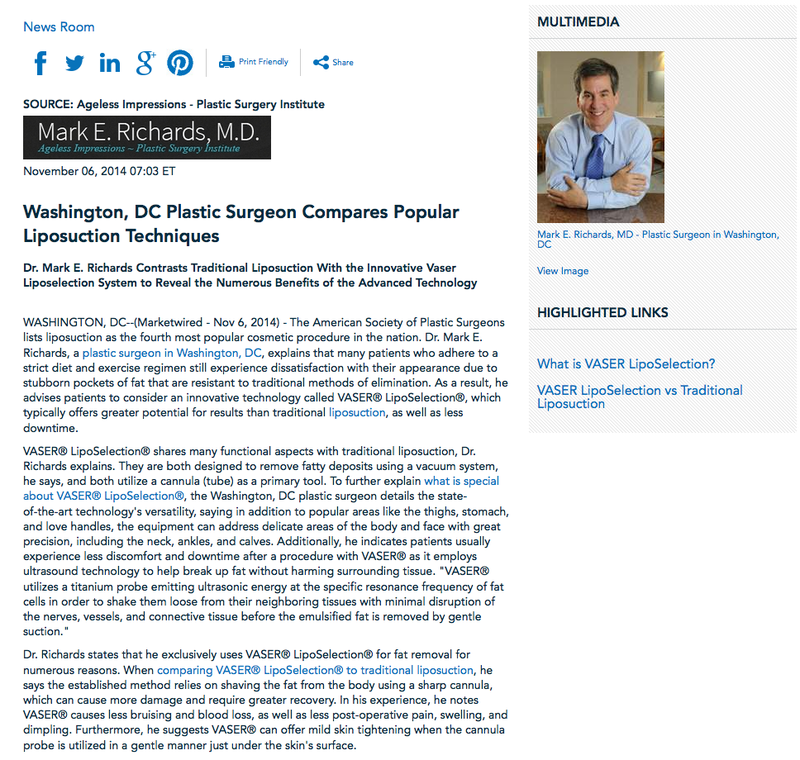 Dr. Richards states that he exclusively uses VASER® LipoSelection® for fat removal for numerous reasons. When comparing VASER® LipoSelection® to traditional liposuction, he says the established method relies on shaving the fat from the body using a sharp cannula, which can cause more damage and require greater recovery. In his experience, he notes VASER® causes less bruising and blood loss, as well as less post-operative pain, swelling, and dimpling. Furthermore, he suggests VASER® can offer mild skin tightening when the cannula probe is utilized in a gentle manner just under the skin’s surface. Certified by the American Board of Plastic Surgery, Dr. Richards received his undergraduate degree from Yale University before going on to earn his medical degree from the University of Maryland’s School of Medicine. He then completed five years of residency training in general surgery and two additional years of training in plastic surgery. Dr. Richards is an active member of several esteemed medical organizations and is the recipient of numerous accolades, including being named a “Top Doctor” by U.S. News & World Report. He is available for interview upon request.